An Etch A Sketch that's perfect for your pocket! This pint-size palette has the same magic screen and the same world famous knobs, it's just built to fit in your child's pocket so they can etch anywhere and everywhere! 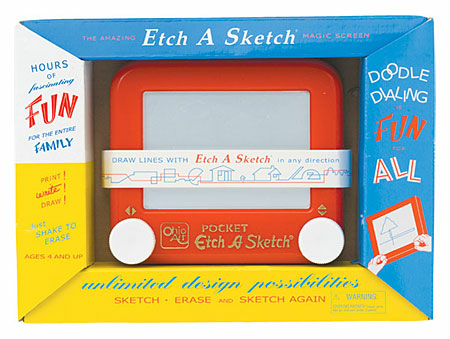 Flashback to the 60s with this mini version of the original Etch A Sketch? A better day is just an etch away with The World's Favorite Drawing Toy . Features: Mini version of the Classic 1960s packaging, Pocket size magic drawing screen, Magically "shake to erase". Ages 4 and up. Size: 4.25" x 3.5"